I don't have a big clothing line, it runs about 13 feet long at the most. Some days it is not quite long enough for a full load of clothing, that's when I bring out my portable drying racks. 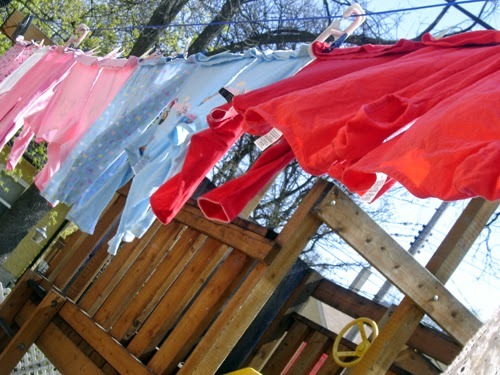 I do love laundry freshly dried by the sun. It makes me a feel a bit better about life and about doing my part in thinking green. Which reminds me, I wonder how my compost is doing this year. I hung a few things out to dry yesterday too. droppings from heaven they are not!